Delivery! The shredder has arrived from Precious Plastic USA. Here is roughly where it's supposed to go on the exercise bike. The 65 tooth chainring will go on the right side. But the challenge still exists of running two chains on the single speed, fixed gear flywheel. I have been working with a local bike shop, Bici Mundo, which deals with a lot of used and older bikes. One of the mechanics had the thought of attaching a 5-speed freewheel to my flywheel where there is only one cog currently. As I said earlier (link above) I'm looking to run a 28 tooth chainring on the exercise bike forward to a 28 tooth cog on the flywheel. Then another chain would run from a 14 tooth cog on the flywheel up to the 65 tooth on the shredder. Well, this 5-speed flywheel's smallest cog is a 14 and largest is a 28. So it should work, if there is enough room. The usable width of any hub is referred to as the Over Locknut Dimension (OLD). The question is whether 5 cogs stacked next to each other will be too wide for this 120mm OLD frame. 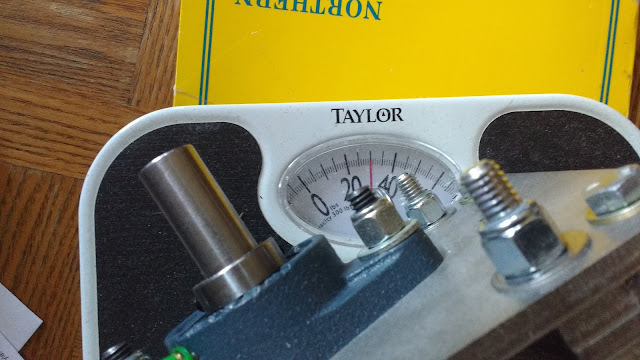 For reference, standard a mountain bike rear hub is 135mm. If nothing else, I could have the dropouts welded onto the frame with wider spacing, but this will be a last-ditch effort if necessary. 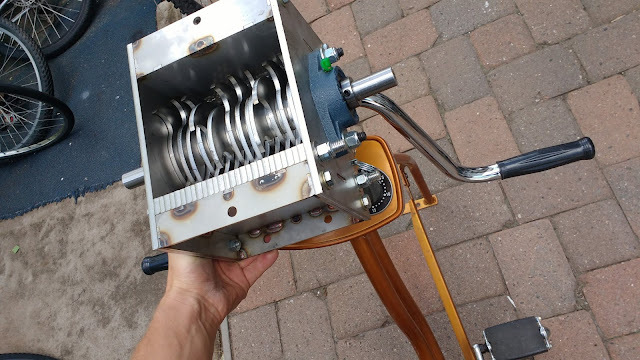 Gearing is one crucial thing to figure out but I will also need to mount this 30 pound shredder up on the front of the bike so it's operable by the rider. It also needs to be adjustable up and down to adjust chain tension. That all should be accomplished pretty easily with a bracket or two. The hopper should arrive tomorrow and I am planning on displaying this at the Flagstaff Community Market this Sunday with the Azulita Project. If you are in Flagstaff, stop by to see it! I decided to check the oven out tonight. It went pretty well but I should have dug out the 1/4" socket before starting! The oven was purchased from the Flagstaff Habitat For Humanity Restore, which sells lots of great used household items and building materials. This oven was marked "tested" so I don't have to worry about whether it works. 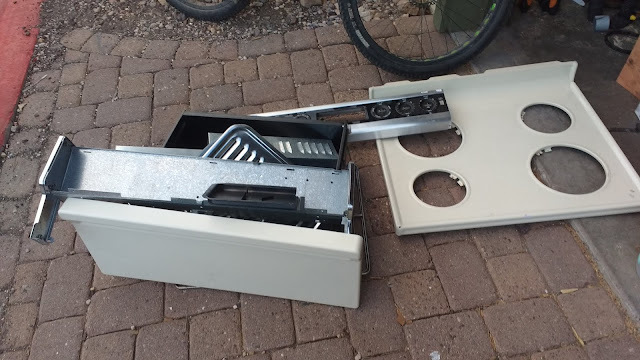 Since I don't need most parts of this for the recycling machine, it needed a bit of tearing down before building it back up. 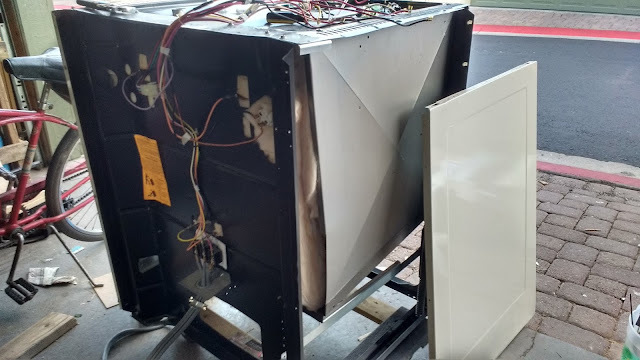 I got the whole stove assembly off and also removed the controls. Quite a few steel parts! Hopefully some will come in handy fabricating a control box later. The rest will get recycled. Thankfully the oven already has fiberglass insulation on four sides- top, sides, and rear. That means I only have to add it to the bottom! Insulation is important not only because I don't want the outside of this getting too hot, but because keeping the heat in will allow it to get up to temp faster and run on less electricity. 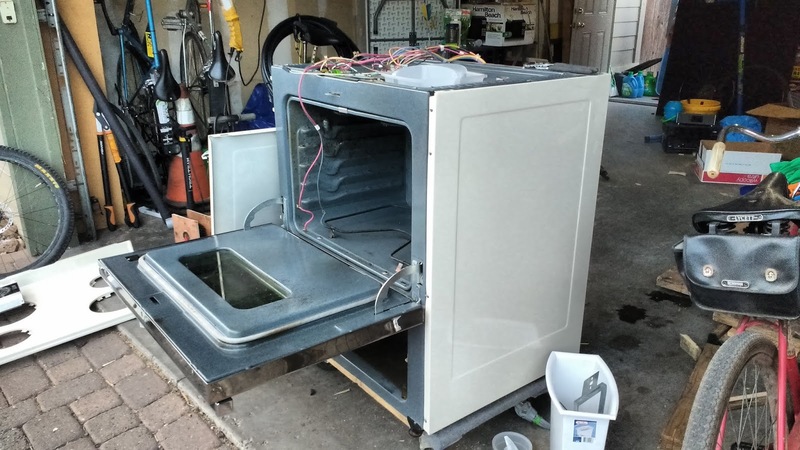 The oven will probably be laid on its side for use as a plastic recycling machine. This allows the shaft above the jack to pass cleanly through the oven wall without interfering with the oven's built-in heating element. Next up for the oven is to check in with my guru Ward Davis, with whom I am doing an independent study course this semester. He will show me how to hook up the controls, and I'll be able to get rid of most of the annoying and now-useless wires up top. 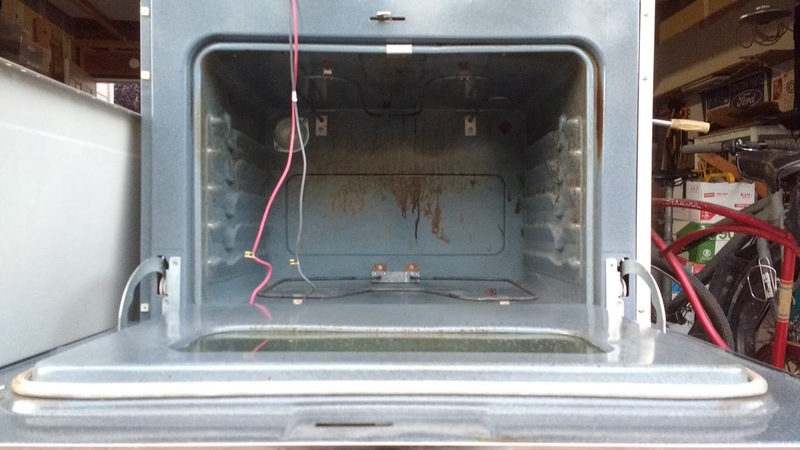 With the drawer removed, I found that the hinge and spring mechanism for the door are hidden below the oven itself. Therefore I may not want to chop everything off, as they essentially did in the prototype. I may use that open space for the control box, mold storage, or some other purpose. Great news everyone! Last Thursday I was invited to speak at the Flagstaff Sustainability Commission in defense of my grant proposal for an extrusion machine (aka extruder). I'm happy to say that I was awarded $2,000 to buy the extruder from Precious Plastic USA! 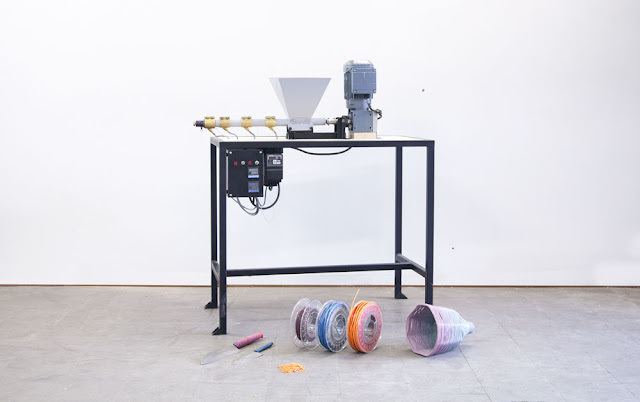 The extruder takes plastic flakes of any combination of colors through the hopper and spits out a stream of plastic, like a big Play-Doh extruder. 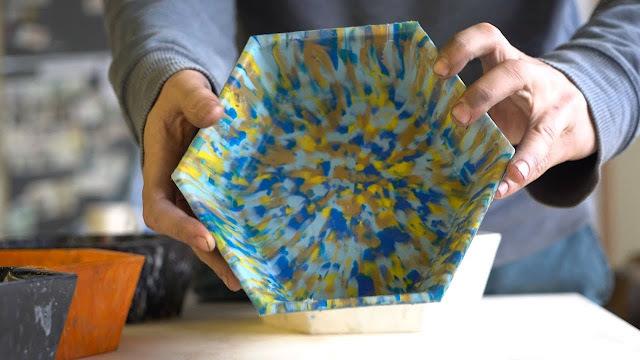 This allows me to produce consistently colored plastic for more professional-looking products. I will still be able to get the cool confetti look (below) but now can make solid colors as well, without worrying about collecting recycling material of the exact same color. 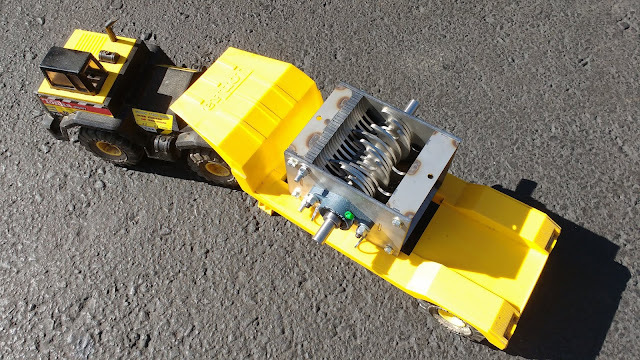 Some people have been experimenting with the extruder as a way to create filament for 3D printers as well. I am not planning to do this, as I would prefer to work on production-oriented solutions made from molds. I believe 3D printers are best suited to complex prototyping work which does not fit my project well. In addition to that grant funding, bringing me to a total of $7,000 I just received another $500 from a family member who thought the project is cool! The result: A whopping total of $7,500 so far, $4,500 of which has been earmarked for machines alone. And one more quick update: the shredder has been completed and is in the mail! Should be here by early next week. I'll be working with the local bike shop soon to figure out a way to modify that exercise bike to send a chain up to the shredder input. Then it's mostly bracket building for the shredder. I'm very excited! Shredder stuff begins! As part of my NAU grant I have ordered a shredder mechanism from Precious Plastic USA in Portland, Oregon. While that is being built, though, I haven't been wasting time. In order to save money and demonstrate the shredder in off-grid places like the Flagstaff farmer's market, I've decided to power it with muscles. 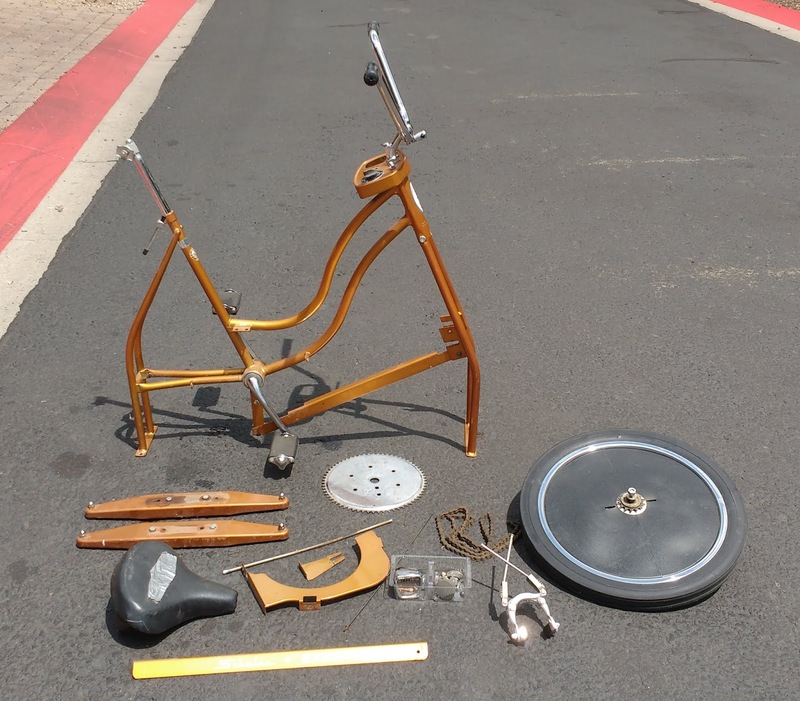 I picked up this early 70's Schwinn Exerciser stationary bike and will modify it to power the shredder directly. The shredder will be mounted up on what might be called the dashboard so it can be operated by the person pedaling. I will have to reduce the gearing substantially as well. A few people have created hand-crank shredders with 5:1 gearing- that is, for every five cranks of the hand, the shredder cranks over once. I will be using leg power instead; since legs are more powerful than arms I will be able to run the shredder faster and with greater force. Technically, this will be a bit tricky but not ridiculous. The bike came stock with a 65T (the T stands for "tooth") chainring going to a 14T cog, spinning that flywheel up to a high speed. Instead, I plan to run a 28T ring from the cranks forward onto another 28T on the flywheel. I'll stack a 14-ish tooth cog next to that 28T and run it straight up to a 65T chainring (pictured) on the input shaft of the shredder. This will reverse the stock ratio, giving it about 4.6:1 gearing. If that turns out to be too easy to pedal, or if the shredder is turning too slowly, I will be able to easily pull out the crankset, change to a larger chainring, and shred at a higher speed. Work on this will continue as soon as I can get that flywheel to the bike shop to figure out how to stack cogs. I will also write a post soon about my "compression machine" progress! In addition to my almost ten year old illustration business I am continually dreaming up new projects to complete. The latest one is also possibly the most complex and involved yet. As part of my master's thesis project in Sustainable Communities at Northern Arizona University, I am building a small plastic recycling workshop in my garage. 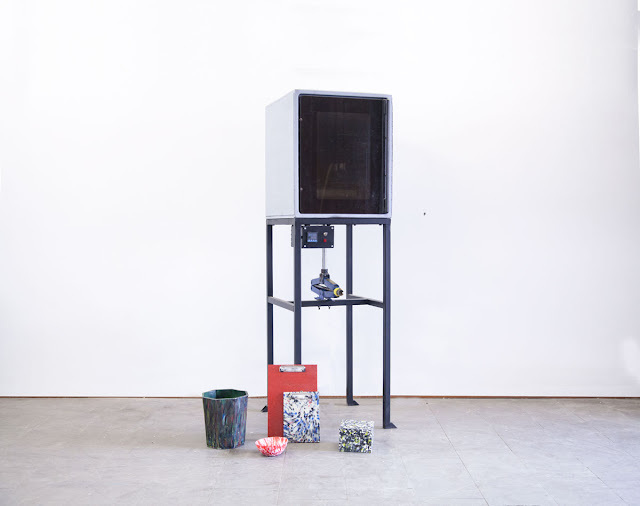 I am constructing a shredder and compression machine from Precious Plastic, a Dutch organization headed by Dave Hakkens, which offers open-source plans for four plastic recycling machines. These will be built off Version 3 plans. After researching the process for building these I realized the cost is very high- $2000 or more for a turnkey shredder! This is partially because the machines are designed to be built from scratch on location anywhere in the world. While this is great for people with access to a machine shop, it does mean that those ordering these laser cut parts from a business end up paying a pretty penny. What I am trying to do is reduce the cost of Precious Plastic machines by building as many steel shredder pieces as possible out of recycled plastic. This is to develop a more affordable shredder that will use fewer expensive virgin materials, instead transforming a former waste stream (used plastic) into a valuable product that will enable more people to recycle more plastic for less money. They will then be able to make their own products, bringing money and skill into their communities. I received a generous $5000 grant from the NAU Center for Ecosystem Science and Society (ECOSS) that is funding the construction of my first two machines- a pedal-powered shredder and a compression machine. So far I have ordered a shredder from Precious Plastic USA in Portland, Oregon. I have purchased a used oven from Habitat for Humanity and have ordered controller parts for the oven. I have also sourced two free exercise bikes for the shredder mechanism and have diverted several used bed frames from the landfill, which will be transformed into cheap, zero-waste tables for these machines! I call this project Praxis Plastics. This page of my website is dedicated to this thesis project and whatever comes out of it. I plan to document any work completed here to aid my memory, act as outreach, and to benefit of others who are embarking on similar projects. Please watch this space in the coming weeks and months!